Various problems led to extended hours at locations in several states. In Texas, a judge ordered nine polling locations in Harris County to remain open an extra hour after civil rights organizations complained. A coalition of groups was seeking the same in Maricopa County, Ariz. And, in Georgia, a local judge kept several sites in Gwinnett County open, including the Annistown Elementary School, where voting was extended by more than two hours. A handful of precincts were also held open for several hours in Fulton County, which includes much of Atlanta. One of the precincts was Forbes Arena, which hosted a rally last Friday featuring Ms. Abrams and former President Barack Obama. Georgia’s elections system was a highly contentious issue during the campaign between Stacey Abrams, the Democrat who was seeking to become the first African-American woman elected governor in any state, and Brian Kemp, her Republican opponent, who is also the secretary of state and thus the state’s chief elections administrator. 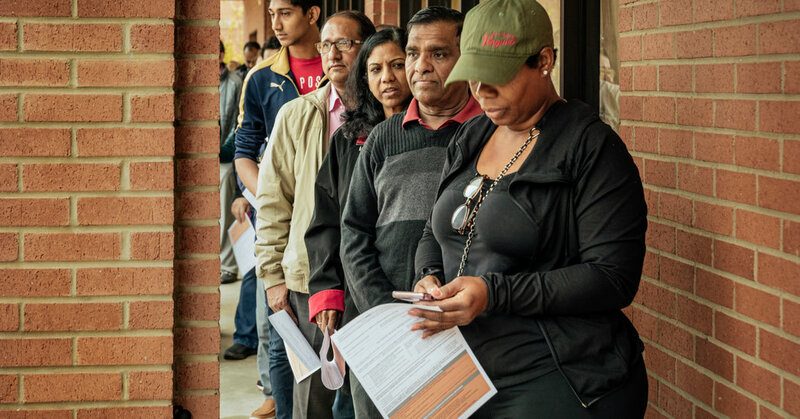 At Annistown Elementary School in Snellville, Ga., in Gwinnett County, voters reported standing in line for hours amid problems with voting machines. One resident, Ontaria Woods, said it took her nearly five hours to vote after arriving around 7 a.m., when the polls opened. After about 30 to 45 minutes, poll workers alerted those standing in line to an issue with the ExpressPoll voting machines, she said.